We love Italian pasta salad. It is one of those dishes that disappears whether I make it for a potluck, picnic or for dinner. Don, Donny and Harley live for Italian pasta salad. I made the mistake of calling my mom’s tuna macaroni salad pasta salad one time, and I thought they were going to revolt. They were so disappointed. Guess what I was buying ingredients for the next day. Yep, everything I needed my Italian pasta salad recipe. I have to admit, I am hooked too. We make it often. It is a perfect potluck picnic recipe or a salad for get togethers. We usually make a double batch, that way, we have one large bowl at home and another for the picnic. Even with 2 bowls, it never lasts. This salad is extremely easy to put together. But there are a few things to do make it easier. Pro Tip: To cut the pepperoni and cheese faster, you can use a mandolin or even an electric meat slicer. People think meat slicers have to be expensive, but this one is not. It is similar to the one we have at home. We save money buy buying whole deboned chicken breast or turkey and hams and using the meat slicer to cut it into deli meat. It is a lot healthier and a whole lot cheaper. Pro Tip: Worried about cutting your hands on the mandolin or meat slicer, or even just your kitchen knives? These cut resistant gloves are the best at protecting your hands and fingers. Pro Tip: You will also want a glass bowl that has a lid. It makes traveling to picnics or get togethers easier. Plus, glass cleans up easier than plastic. I love this glass bowl set. Related: Looking for other recipes that are perfect for a picnic? Try this delicious broccoli salad recipe, taco dip, mocko taco salad, and buffalo chicken boat recipe. 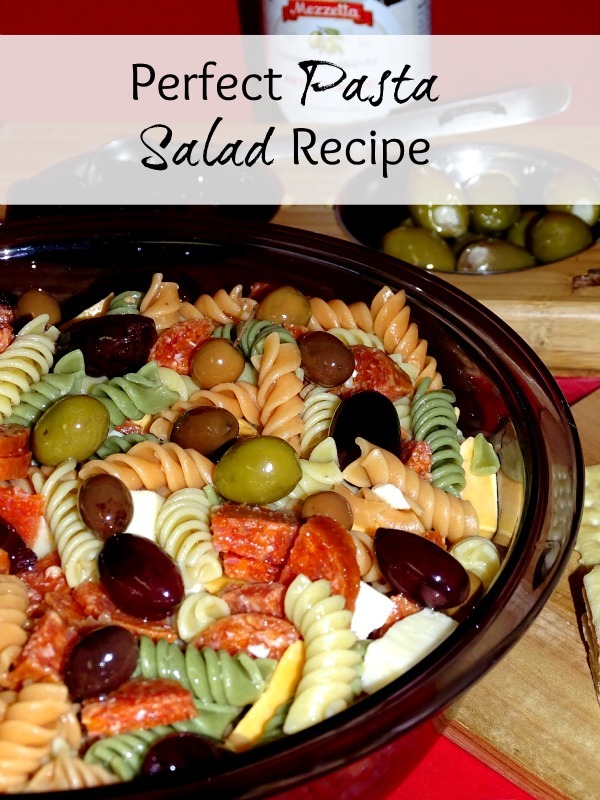 I have seen pasta salad recipes made a few different ways. 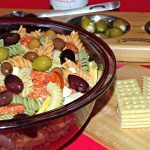 We don’t make our pasta salad with italian dressing but it is easy to change this recipe to make it a pasta salad with italian dressing. Simply swap out the vinegar and oil. 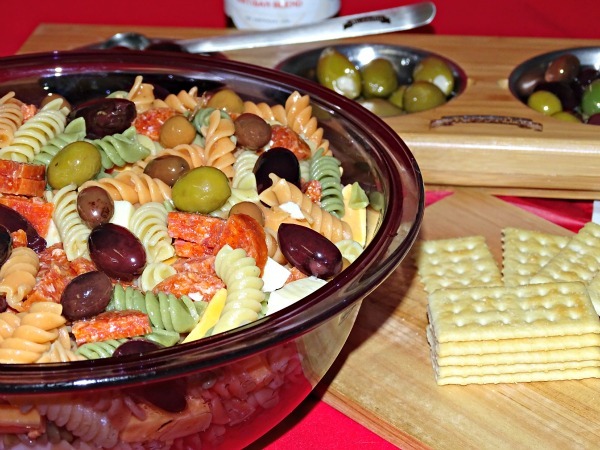 I have also heard this italian pasta salad called pepperoni pasta salad. I can see that because one of the best parts of this italian pasta salad is the pepperoni. 1 stick of pepperoni. You can use the slices. I like the sticks because I like the big chunks of pepperoni. 1. As you finish each step, add it into a very large bowl. 2. Start water to cook the pasta. Be sure to salt the water. This will make the noodles have more flavor and you will not have to add salt to the pasta salad. Cook until al dente. Cool the noodles before adding into the bowl. 2. Cut the pepperoni into slices, then quarter each slice. 3. Cut the cheeses into cubes. 4. Make sure the olives you use are pitted, or pit them before using. Pour some of the dipping oil from the olives into the pasta bowl. 5. After adding all of the ingredients into the bowl, add in the oil and vinegar. Mix everything all together. Serve immediately or chill. It will last for a few days in the refrigerator, well, that is, if you can get it to last that long. Ours is always gone right away, usually the same day. As you finish each step, add it into a very large bowl. Start water to cook the pasta. Be sure to salt the water. This will make the noodles have more flavor and you will not have to add salt to the pasta salad. Cook until al dente. Cool the noodles before adding into the bowl. Cut the pepperoni into slices, then quarter each slice. Cut the cheeses into cubes. Make sure the olives you use are pitted, or pit them before using. Pour some of the dipping oil from the olives into the pasta bowl. After adding all of the ingredients into the bowl, add in the oil and vinegar. Mix everything all together. Serve immediately or chill.